Crimson Red Leaves Background by Carol VanDyke - 10.000" x 6.625"
Crimson Red Leaves Background framed print by Carol VanDyke. Bring your print to life with hundreds of different frame and mat combinations. Our framed prints are assembled, packaged, and shipped by our expert framing staff and delivered "ready to hang" with pre-attached hanging wire, mounting hooks, and nails. 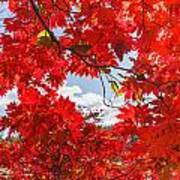 There are no comments for Crimson Red Leaves Background. Click here to post the first comment. 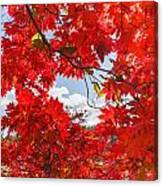 A background of crimson red autumn leaves against a blue sky. What to write? �I�m a morning person; love sunrise, spring and fall; awed by Mother Nature who creates stunning landscapes for us to view and capture; humbled by buyers who spend their hard earned money for one of my prints; grateful for a wonderful husband, 2 dogs and 2 children�a son who takes me with him on many photo shoots even though our shots are similar (but he�s Nikon and I�m Canon); a bit seasoned rather than fresh and new; and excited for the next adventure. Thanks for viewing my page.